For this top's chest width, the vendor measures the full chest at a point 1" below each armpit. For body length, the vendor measures the front from the top of the shoulder to the bottom hem. 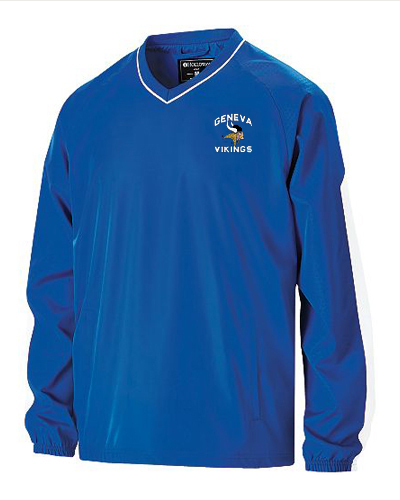 Wrap yourself in this Micron™ polyester Wind Shirt, a lightweight, wind/water-resistant pullover. The sleeves and arms are embossed with a screenmesh print, and there's a jersey and taffeta lining for added warmth. V-neck striped rib-trim collar, elasticized cuff, easy entry front pockets, adjustable bottom hem with hidden drawcord closure.